 Watermelon agua fresca with a spicy rim. Or, switch out the salt on your Margarita (recipe). Fresh fruit perks up with a sprinkle of Tajin. 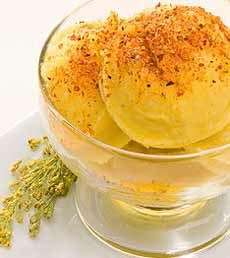 On ice cream or sorbet: cool with sweet heat (photos #1, #2 and #3 courtesy Tajin). 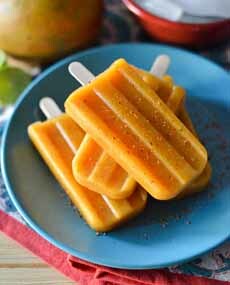 A sprinkle of Tajin is a must on paletas—Mexican ice pops. 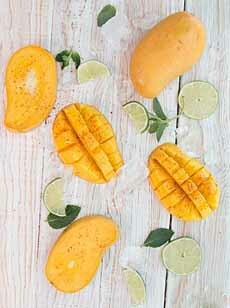 Here’s the recipe for these mango-lime paletas sfrom Christy Wilson Nutrition. 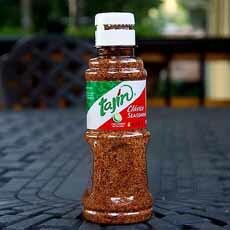 Tajin: Buy a bottle of mix your own (see bingrediengs below; photo courtesy PicClick). 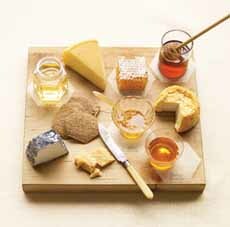 Mix it into condiments, from ketchup to honey (photo of cheese board courtesy Martha Stewart Living). Mankind has been combining sweet and spicy flavors since ancient times…and up to just yesterday (2016), when Doritos Spicy Sweet Chili tortilla chips appeared on store shelves. The combination of sweet heat has been part of global cuisines from Asia to Mexico. If you’ve never sprinkled a mango or lime paleta—a Mexican ice pop—with spicy heat, you’ve been missing out! Cultures around the world variously use black pepper, chiles, horseradish, mustard, wasabi and white pepper for heat. 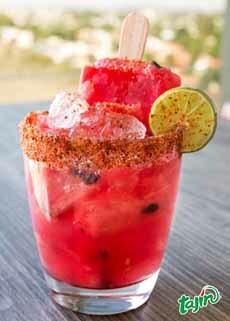 Whatever the combination with whatever sweet element (agave, honey, sugar, fruit), after an initial bite of sweet, the heat builds into a kick: a combination that appeals to many. For Cinco de Mayo, we’re focusing on the famous heat of Latin America: hot chiles (all about chiles). At the restaurant level, sweet and spicy has been showcased in casual fare (burgers, chicken wings, pizza), chocolate (bars, bonbons, desserts and spicy hot chocolate). Ketchup and other sweet condiments are good candidates to combine sweet and heat. Small manufacturers have long been featuring sweet and spicy, from jerky flavors to rice chips, tortilla chips and crackers. Even chocolate bars, a standard bearer for sweet, has been combined with spicy for at least 20 years. Today, you’ll find this combination in everything from savory Mexican mole sauce to desserts. In fact, the first chocolate consumed—an Aztec beverage for the elite—ground roasting cacao beans, with and vanilla—plus chiles, allspice and spicy petals from a local tree (Cymbopetalum penduliflorum, a member of the custard apple family known in English as sacred earflower. While honey only arrived with the Conquistadors in 1519, the local agave sap was not used as a sweetener. Why sweet heat? Why now? More and more Americans are enjoying spicier foods, due to the growth in popularity of International cuisines (not just Mexican, but Indian, Thai and numerous others). They ported the sweet-heat combinations found in ethnic dishes to provide a more complex depth of flavor to traditional, European-based foods. When sweet is added to spice, the heat is mitigated, allowing the taste of the spice to be better captured and appreciated without burning one’s taste buds. When spice is added to sweet, it gives food an unexpected kick. If you’re ready for some sweet heat, start with a spice mix. You can play with hot sauce and sliced of pureed jalapeños later. Mix your own hot spice blend (more about that below), or buy a bottle of Tajin seasoning. Made by Tajin Products, a Mexican company, this mildly spicy seasoning combines chili, lime and salt. It is delicious on fruits: citrus, cucumber, melon, and tropical fruit (mango, papaya, pineapple, etc. ); and in cooked fruit recipes. A Mexican staple, you can find Tajin seasoning in the Mexican foods aisle in supermarkets, in Latin American food stores, and online. If you want to make your own, mix lime zest with cayenne, chile flakes, chile powder, jalapeño—or go beyond Mexico to layer on international heat: black pepper (India), horseradish (Mediterranean), hot paprika (Spanish Basque region), mustard powder (China) or wasabi (Japan). You can add yet another layer your spice mix—perhaps some cumin or curry powder. Spices don’t have a single flavor profile: They have several. Thanks to Spices Inc. for this analysis of the 15 most commonly used sensory characteristics when describing the flavor and aroma profiles of spices. Both spices and herbs are obtained from plants. Spices are seeds, fruits, roots, barks, or other plant substances, primarily used for flavoring, coloring or preserving food. Herbs are the leaves, flowers, or stems of plants, used for flavoring or as a garnish. While pepper is a spice (it’s the fruit of a vine), salt is neither an herb nor a spice. It is a mineral, mined underground (from ancient, dry lake beds) or evaporated from sea water (i.e., sea salt). It is thus not included with these taste characteristics, as its flavor in foods doesn’t come from spices (or herbs). Spices have secondary functions as well, for coloring and as a preservative, antioxidant or medicine. The focus here is on their culinary uses: flavor and color. Bitter: ajwain, bay leaf, celery, clove, cumin, epazote, fenugreek seeds, horseradish, juniper, lavender, mace, marjoram, oregano, savory, Sichuan peppercorns, star anise, turmeric, thyme. Cooling: anise, fennel, sweet basil. Earthy: achiote, cumin, saffron, turmeric. Floral: coriander, lemongrass, rose petals, saffron, sweet basil thyme. Fruity: anise, fennel, nigella, savory, star anise, tamarind. Hot: black pepper, chiles, horseradish, mustard, wasabi, white pepper. Nutty: ajwain, black cardamom, coriander seed, cumin seed, fenugreek seeds, mustard seed,poppy seed, sesame seed. Piney: bay leaf, rosemary thyme. Pungent: allspice, epazote, garlic, ginger, grains of paradise, horseradish, marjoram, mustard, onion, paprika, spearmint, star anise, wasabi. Sour: amchur, pomegranate, sumac, tamarind. Spicy: bay leaf, cassia cinnamon, clove, coriander, cumin, curry leaf, ginger, marjoram, nutmeg. Sulfury: asafoetida, chives, garlic, onion. Sweet: allspice, anise, caraway, cassia cinnamon, chervil, clove, dill seed, fennel, green cardamom, nutmeg, poppy seed, sesame seed, star anise. Woody: cardamom, Ceylon cinnamon, clove, juniper, lavender, rosemary, Sichuan peppercorns.